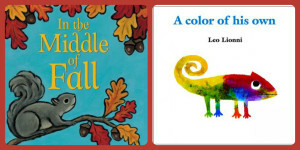 This week we shared stories about fall colors, the changing colors of a lonely chameleon and learned what happens when silly baby ghosts eat grapes, carrots, lemons, blueberries and strawberries! After storytime, we made a giant rainbow together! With glue sticks in hand, the kids glued colorful pieces of felt, foam shapes, bits of ribbon and yarn, even buttons on our cooperative project. It was so fun to watch kids really focus and engage in creating this messy work of art. Because children learn best when they are using their hands and engaging their senses, a simple project like this is provides the perfect multi-sensory activity. Jenny grew up in Idaho where she loved climbing trees and building houses for tiny stuffed animals. Jenny loves managing the picture book collection and doing Preschool Storytime. She tells families to never stop reading picture books- they are for EVERYONE!